Olivia Cleans Green: 5 Peanut Butter Sandwiches Gone Wild! I am so into peanut butter sandwiches right now. Here are five great PB sandwiches I've enjoyed recently. They're all healthier and more interesting than peanut butter and jelly. Peanut Butter + Baby Spinach + Honey (about a 1/2 tsp of honey is enough for ultimate yumminess). Note: Try it closed-faced so it's easier to bite into without having spinach fly in your face. Peanut Butter + Apples + Spinach + Cilantro + Sriracha. Think Thai food. I had this at Benefit Juice Bar & Cafe. If you ever are in Providence visiting RISD this is a great place to grab lunch. 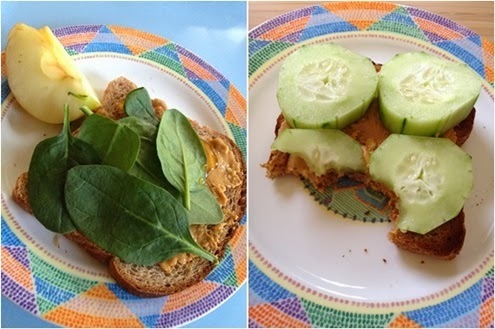 Peanut Butter + Cucumbers. Medium thickness slices, about as thick as your pinky nail, work best. I don't understand why this is good but it is. Peanut Butter + Celery + Raisin. Think ants on a log. Random tip: When shopping for peanut butter, read the label. I like nut butters with two ingredients maximum: nuts and salt. Make sure the peanut butter doesn't contain sugar or high fructose corn syrup. You can always add your own sweetener like honey or agave or fruit to whatever you're preparing. What's your favorite PB sandwich combo?